We were strolling along Warren Street in Hudson this past weekend when we came upon this happy sight. 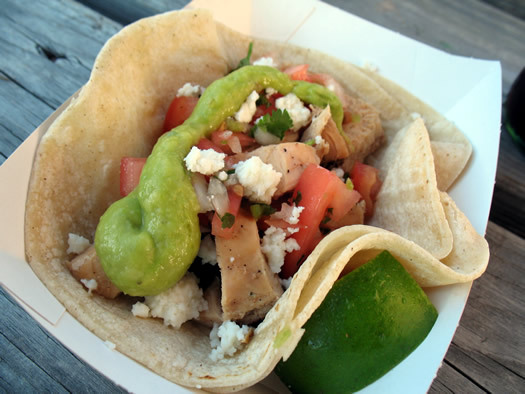 Generally speaking, we hold that taco trucks = good idea. But this stand -- all shiny and parked among the picnic tables -- gave off an especially happy vibe. Had we already eaten dinner? Yes. Would this stop us from having a taco? No. So, already somewhat full from pizza at Baba Louie's, we stepped up to order a taco from Tortillaville. Pork, please. Alas, out of pork. OK, we'll go with the chicken. To wash it down: a Mexican Coke in the bottle! The taco came with chunked chicken, salsa fresca, guac, and queso fresco on a two warmed corn tortillas. It was a solid taco -- especially after a hit of Cholula. The chicken was moist, the salsa and guac tasted like actual vegetables and the queso fresco added some saltiness. It wasn't necessarily the best taco we'd ever had, but it was quality. Even on a stomach already full of pizza. And the Mexican Coke... so silky. The Tortillaville menu includes a range of tacos -- bean, veggie, tofu, beef, pork, steak (sometimes), fish, shrimp and chicken. Tacos are $2-$3. There are burritos ($5-$7) and plates ($7-$8). Another good thing about the stand is the owners, Brian and Allison. They were very friendly and laid back. This is their second year in Hudson (the first at this location, they had another spot on Warren last year). They set up there from May until October. When it gets cold, they hitch up the trailer and head for Key West, where they operate during the winter. It was a good time knocking back a taco, sipping our Coke and watching the people walk by on Warren. We're already looking forward to doing it again. The stand is next to Dogs of Hudson. Some may say this place is better than Mexican radio and there is no question that it is cheaper! And the Mexican Coke... so silky. Yea, it'll be that way. It gets cut more as it travels further from the "source" ..oh wait, I think you mean something entirely different. Oh I agree....this place is awesome....and QUICK!!! Bros Tacos in Albany has good food, but the last time I was there, it took 35 minutes for 5 tacos total, to go....this place is very, very quick. And tasty. 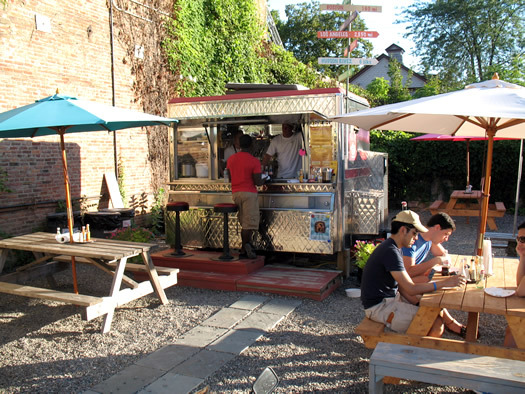 Where are the taco trucks in Albany?